In some patients, a pacemaker can be surgically implanted to treat a slow heartbeat. A pacemaker uses electrical impulses to stimulate the heart to beat in a normal rhythm. Patients are carefully monitored to ensure proper functioning. Sometimes a heart arrhythmia results in a slow and inadequate heart rate (bradycardia). Your doctor may recommend a pacemaker if you have persistent symptomatic bradycardia. There are different types of pacemakers; your doctor will discuss the best option for you. 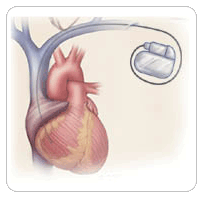 A pacemaker implantation is a surgical procedure which takes about 2 hours. During the procedure a catheter is inserted under your collar bone into a vein through which thin wires or leads are threaded into one or more chambers of your heart. These leads are connected to a pacemaker generator which consists of a miniature computer and a battery to deliver electrical signals to your heart. Once the generator is programmed, the pacemaker will regulate the impulses that signal your heart to contract or beat. Some rapid heart arrhythmias such as ventricular tachycardia or ventricular fibrillation are associated with sudden cardiac death. If you have had or are at risk for one of these arrhythmias your doctor may recommend that you get an implanted cardioverter-defibrillator (ICD). The type of ICD you get will depend on your arrhythmia and heart health history. Most ICDs also have the ability to function as a pacemaker to regulate your heart beat if necessary. The implant is a surgical procedure similar to a pacemaker operation which takes about 2 hours. During the procedure a catheter is placed under the clavicle and the ICD leads are inserted into one or more chambers of your heart. These leads are connected to the ICD generator. Once programmed, your ICD can stop potentially life-threatening rapid heart beats by overriding or resetting your heart rate or by delivering an electrical shock. Copyright 2009 Gainesville Heart & Vascular Group. All rights reserved.